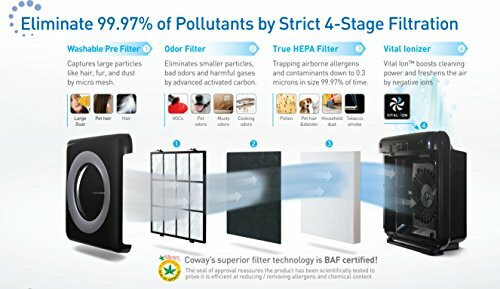 Coway makes one of the best purifiers for the money. Their AP-1512HH is widely regarded as a top pick on most of the reputable review sites. And, for good reason. They offer real performance for a very reasonable price. That’s why we wanted to revisit our original Coway Air Purifier Review and see if it still holds up against some of the latest offerings like the machines from the Blue Pure line. We’ll get into why this purifier is so great below. But, if you’re short on time… take our word. This is a great purifier; you won’t be disappointed. Granted, there are better purifiers for different uses, but this purifier is so good we’d buy one and find a place to use it. Keep reading to see where it works best, why it’s better than similarly priced purifiers, and which purifiers edge it out in a few key areas. But first, let’s cover some of the pros and cons. The Mighty Air Purifier is one of the best-selling products in Coway’s line of air purification systems. It is a well-designed machine featuring several different technologies that make it suitable for general-purpose use. 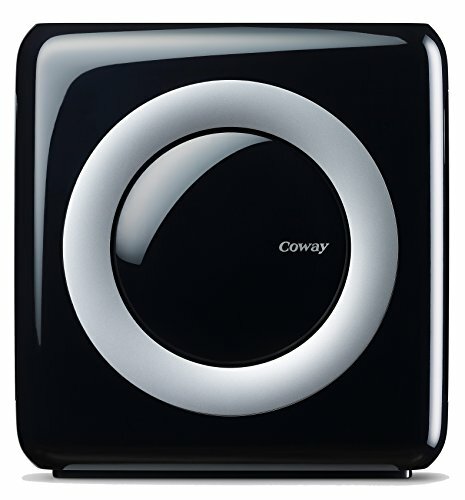 Coway designed the Might Air Purifier around a 4-stage filtration system. Thus making it an excellent general-purpose machine. Multiple stages of filtration are essential because they allow a machine to target a large spectrum of impurities in the air. Many brands choose to skip a pre-filter to cut costs. But, Coway thinks the pre-filter is very important. This filter is responsible for targeting the largest particles like dust and pet hair. More importantly, this filter extends the life of the other filters inside the machine. Think of it as a shield that blocks larger particles. As an added bonus, this filter is also washable. Filters that target odor are commonly known as activated carbon filters. These highly effective filters eliminate odors through adsorption. A process similar to absorption, but that describes how gasses are trapped in a porous structure. Just like the way a sponge traps water. Activated carbon is an extremely porous material that has the unique ability to target pollutants at an atomic level, making it possible to adsorb extremely small particles as they come into contact with the carbon. Other “technologies” that tout odor killing capabilities are typically either nonsense or produce dangerous compounds. Activate carbon will help eliminate smoke, pet odor, and paint fumes. But, if this is your primary objective… there are way better options for a little more money. Take a look at Austin Air instead. High-efficiency particulate air filters are the industry gold standard. HEPA filters consist of an ultra-fine fiber material that targets pollutants as small as .3 microns. They are very effective. The Center for Disease Control even recommends them to help fight pathogens and other dangerous contaminants in the air. HEPA filters target a large spectrum of pollutants. Which makes them especially useful for people who suffer from asthma or allergies. Both of which are triggered by the particulate matter that this filter traps. It’s really just an ion generator, but must think a naming upgrade helps. Coway’s vital ion technology is the final step of the filtration process in the Mighty Air Purifier. This feature emits negative ions. The charged particles attach to other particles like dust and pollen. And that makes them bigger; which makes them easier to capture in the machine’s other filters. 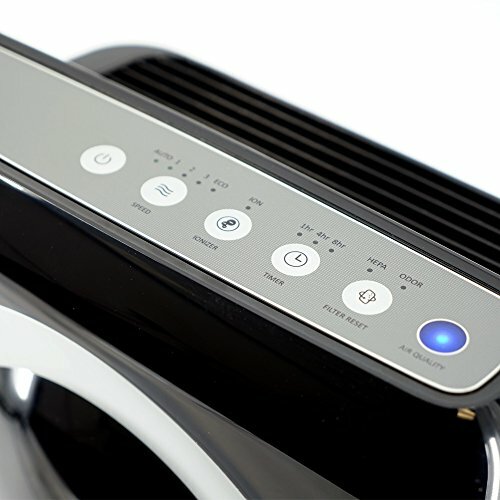 Another feature that is unique to the Coway air purifier is the eco-mode option. In eco-mode, the fan automatically shuts off when no pollution is detected for 30 minutes. This feature is designed to lower the cost of operation and reduce the carbon footprint of the machine. While many air purifiers rely on a simple knob for adjustments, the Mighty Air Purifier features an electronic control panel, which displays several buttons that allow you to adjust the multiple features of the machine. There is a button to cycle between automatic and manual fan speeds, and another to turn the ionizer on or off. It also includes a sleep timer for 2, 4, or 8 hours. On low… there aren’t many purifiers this quiet. It’s bout 22 dB and that’s pretty amazing. If you crank it up to high it gets a little loud, but that’s what gives it the 500 plus square feet of coverage. Bottom line; you won’t be disappointed by this purifier when it’s quietly cleaning the air you breathe. While this machine features a variety of different technology, it is most effective at eliminating dust, dander, and pollen. 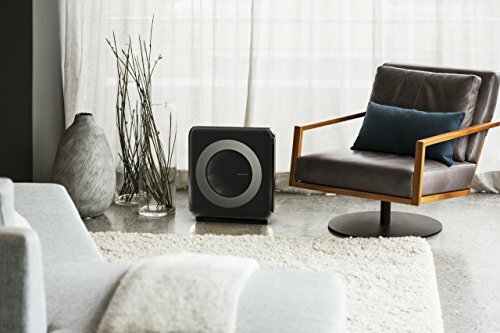 This makes the Mighty Air Purifier a good fit for users who live in cities with poor air quality and other environments that contain excessive amounts of dust and pollen. The HEPA filter also makes it a good choice for those who suffer from asthma and allergies. However, if you are looking for a machine specifically for smoke, paint, or other chemical odors you may want to look elsewhere. While this machine does have an odor filter, it does not contain a significant amount of activated carbon. This machine eliminates some smoke and odor. However, a purifier like one from Austin Air, with lots of carbon, will perform better. For example, you can check out this one here. How does it compare to other (newer) purifiers? When this purifier was released it was a home run in the “budget-friendly” category. Its filter ws great. It was super quiet. Affordable to own and operate. It had it all. Well maybe not the chops to keep up with a top tier purifier ar removing smoke and odor… but for everything else it was a game changer. Now, with purifiers growing in popularity we’re seeing some really awesome competitors hit the market. Blueair’s Blue Pure line is the first to come to mind. How does it compare to purifiers within a hundred dollars in terms of room size (coverage)? As you can see from the chart above, the AP-1512HH gets some stiff competition from slightly more expensive purifiers. But they are about one hundred (or more) dollars to buy. The filters are also more expensive. Though some last much longer than the Coway’s. To be honest the purifiers that provide greater coverage are really only worth it if you have a huge space to purify, you need to capture odor and VOCs, you’re a smoker, or own pets. In our opinion the purifiers from Winix that are similarly priced are not in the same league as the Coway. However, the Blue Pure 211 + is really worth a look if you’re considering the Coway. That Blue Air is kind of like 2018’s AP-1512HH. It only costs about 30 or 40 bucks more… it has waaaay higher stats (like more activated carbon, larger coverage, and better CADR). Plus we think it looks a little better. On paper the only place the Coway still wins is in how quiet it is, a low filter price, and the clean air sensor. It is easy to compare prices and performance on paper. However, evaluating true value is way more complex. Here is our how we think the Coway scores in key areas (i.e. how it pays you back). The Coway brand calls South Korea home. And, they are committed to designing home wellness products that improve their livability in consumers’ homes and offices. Coway covers a wide variety of products in addition to air purifiers, including juicers, vacuum cleaners, water filtration systems, and humidifiers. Their dedication to quality health products earns them numerous awards, certifications, and endorsements from around the globe. The AP -1512HH is one of the best value machines for the price. Buyers with allergies and asthma will benefit most from this purifier, especially in spaces about half the size of the manufacturer rated coverage. If you are looking to purify the air in a bedroom or home office without breaking the bank – this is one of the best options on the market. There are other air purifiers on the market that are more effective for smoke and other strong odors. However, the Mighty Air Purifier is still a great general-purpose machine.